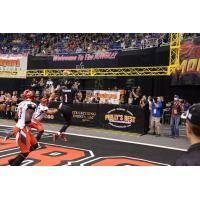 The Orlando Predators (12-5) were eliminated from ArenaBowl contention after falling to the Jacksonville Sharks (8-9) in the first round of the postseason in front of 12,171 fans at Amway Center by an overtime score of 69-68. Bernard Morris scored nine total touchdowns on the night, completing 22-of-31 attempts for 277 yards with five touchdowns and one interception while adding 22 yards and four scores on the ground. Larry Brackins hauled in eight catches for 122 yards and four touchdowns, while LaMark Brown caught six passes for 64 yard and another score. Brandon Thompkins snared eight passes for 91 yards, but was held out of the end zone for the first time this season. Linebacker Terence Moore put forth a career night for the defense, logging seven tackles with one interception returned for a touchdown, one forced fumble and one fumble recovery. Orlando took an early 14-7 advantage as Morris connected with Brackins on two first quarter touchdown throws. The Predators added to the lead on the opening drive of the second quarter when Moore picked off a pass by Sharks QB Tommy Grady and took it 42 yards to the end zone to go ahead, 21-7. Moore made his presence felt again a series later as he stripped FB Derrick Ross at the goal line and recovered the fumble to regain possession. However, Morris' first pass of the resulting drive was tipped and intercepted by Jacksonville LB Alvin Ray Jackson, who took it in for a two-yard score to cut into the lead, 21-14. Morris needed only one play to shake off the turnover as he fired a 24-yard touchdown pass to Brackins, putting the Predators up 28-14 midway through the second. Jacksonville responded with two unanswered scores, beginning with a 22-yard touchdown catch by WR Reggie Gray. With time winding down in the half, Brackins fumbled on a catch after taking a hit over the middle and DL Jordan Miller recovered for the Sharks. Grady attempted one final heave to the end zone as time expired in the half and WR Anthony Jones came down with an improbable 27-yard touchdown after catching the rebound off the net. The Predators managed to take a 28-27 lead into the half after the Sharks missed the resulting PAT attempt. Jacksonville took its first lead off a 14-yard scoring reception by WR Joe Hills on the opening drive of the third quarter, but Brackins answered with his fourth touchdown catch as he stiff-armed a defender and raced 41 yards to the end zone for a 35-33 advantage. Orlando held a 48-46 lead midway through the fourth quarter after exchanging rushing touchdowns with the Sharks. Bernard Morris capped off two drives with three-yard scores on the ground, while Derrick Ross ran for a pair of one-yard touchdowns for the Sharks. Ross would score from a yard out for a third time a series later, giving Jacksonville the 53-48 lead with just under five minutes to play in regulation. Morris and the Predators battled back, scoring off a seven-yard pass to LaMark Brown to retake the lead, 55-53. With 54 seconds remaining, the Sharks scored on a 10-yard reception by Hills to go ahead, 61-55. The Predators would regain possession and drive to the goal line before strategically running down the clock to just one second. Facing 4th-&-goal from the one, Morris kept it on a run and stretched the ball over the goal line to tie the game, 61-61. The Predators had a chance to win it on the PAT but missed the attempt, sending the game into overtime. Orlando received to start the overtime period and converted its possession into points as Morris scored on a three-yard run to break the tie in favor of the Predators, 68-61. Jacksonville found the end zone moments later as Ross scored for a fourth time on the ground. For a moment, the Predators appeared to have sealed the victory after breaking up Grady's pass on the two-point conversion. However, Orlando was flagged for pass interference and Ross ran it in from a yard out, sealing the defeat for Orlando.